Where a full concrete masonry wall is not practical or possible, Veneer units manufactured by Angelus Block afford the same attractive and maintenance-free wall surface as structural cmu. Certain conditions may exist that would dictate use of Veneers instead of a full cmu wall, such as weight limitations in a wall, cantilever, long spans, existing walls, etc. Otherwise, it is generally more economical to construct a conventional structural cmu wall. The installed cost of concrete masonry veneer is very near that of a full hollow unit wall of like face texture, and, added to the cost of the structural backing, will likely total more than a self-supporting cmu wall. Concrete masonry veneer units are installed as anchored veneer or adhered veneer. Construction and materials are governed by Chapter 14 of the California Building Code and Chapter 12 of MSJC (TMS 402/ACI 530/ASCE 5). See Anchored Masonry Veneer Code References. Please refer to the code for specific requirements. A common veneer system consists of (from inside out) the structural back-up (studs and plywood sheathing shown here), waterproof sheathing, wall ties, 1-inch min. 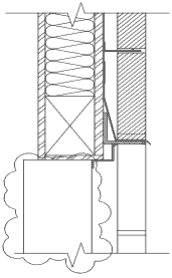 air space, joint reinforcement, and the cmu/mortar installation. 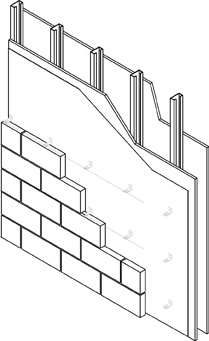 The basic elements of a veneer application above an opening, including a steel angle lintel and flashing. While most cmu veneer require anchored applications, Angelus has Thin Veneer that can be adhered when made in a lightweight mix. A 4-inch high stretcher and L-corner are available in any of our colors (except Glacier White), and in Quik-Brik®, the blended color cmu that provides brick-like character with cmu economy and durability. Consult your representative for availability of other heights. Construction and materials are governed by Chapter 14 of the California Building Code, which refers to Chapter 12 of TMS 402. Section 12.3 - Adhered veneer. See Adhered Masonry Veneer Code References. Please refer to the code for specific requirements. Note: The illustrations herein are very generalized and may not account for conditions and requirements specific to your project. 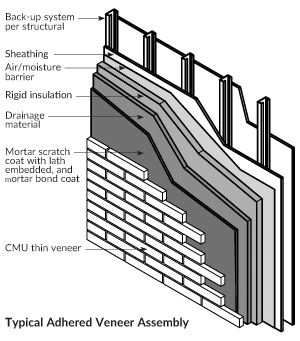 Adhered veneer is not a proprietary, cmu-specific installation, but is governed by building codes. Cmu is simple and straightforward in its installation. However, other materials and layers as required for the project may be manufacturer-specific in their installation. Therefore, we recommend obtaining details and assistance from manufacturers of such specified items.